On Aug. 17, 2010, inspection team of the Japan Geopark Committee visited Kochi to evaluate the Muroto Geopark for its registration in the Global Network of National Geoparks. The Muroto Geopark is located in the east of Kochi prefecture, and consists of entire Muroto city area on the Muroto Peninsula. The KCC serves as an intellectual base for the Muroto Geopark, and provides scientific support. 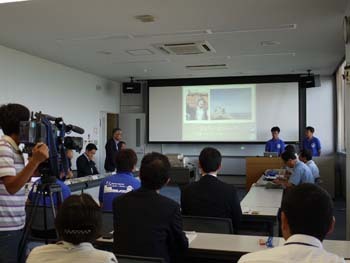 Staff members of the Muroto Geopark, and KCC explained the characteristic stratum of Kochi prefecture and connection of both institutes to the team members. Inspection team also observed activities of the KCC like curation of cores, including cores from Muroto transect in a reefer, and how researchers take samples from cores, etc.